Caption: Students Hannah, Grace, Charlotte, Tia, and Torie, along with Teacher Michaela Kargus, prepare for the rally they helped organize. 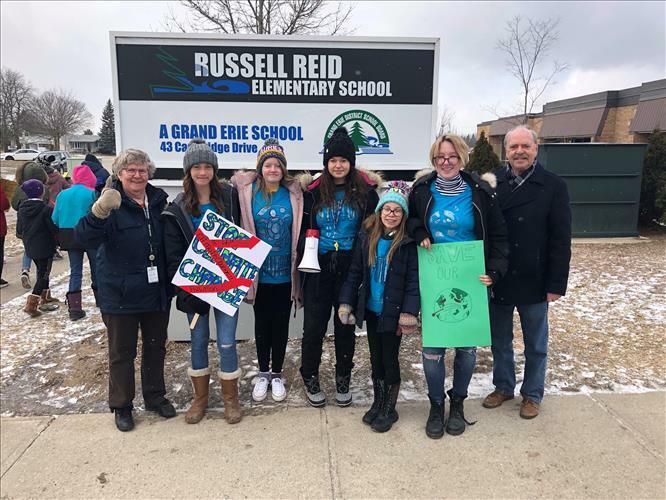 Mahatma Gandhi’s oft-repeated words rang true at Russell Reid Public School last Friday (February 8), when a group of environmentally consciously Grade 8 students organized a rally to raise awareness of climate change, and to put pressure on elected officials who are in a position to do something about it. The initiative grew out of a data management assignment in Mrs. Kargus’ Grade 7/8 class to collect information about the school’s recycling program. The data began to reveal that even with the blue bins in place, they weren’t always being used properly, and so the group set out to determine why. It became apparent that an awareness-raising campaign was needed at the school. The group didn’t expect to catch the attention of a City of Brantford Councillor, however. Caption: Students had the support of Trustee Carol Ann Sloat and Brantford Councillor John Sless during the rally. Sless was on hand at the rally, and has invited the students to be a part of what will likely be at least a year-long process to pass the bill. “It should be the ultimate civics lesson,” Sless said. With placards reading “Make the Planet Cool Again,” and a chant of “Hey, hey! Ho, ho! 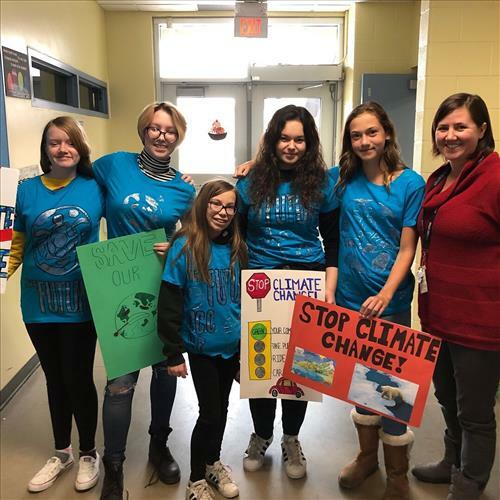 Climate change has got to go,” intermediate students left their classrooms briefly and took to the sidewalk, Charlotte using a megaphone to drum up further enthusiasm for the cause. Passing cars offered honks and waves. The group has plans to continue building the momentum the rally helped spark, and is bringing plenty of awareness and action to their school in the process. Grand Erie District School Board Trustee Carol Ann Sloat was also on hand for the rally. She was impressed with the passion and knowledge of the students and the efforts of the entire school in putting the environment first.